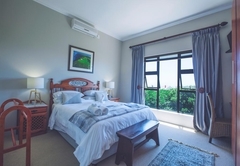 Mossel Bay Golf Lodge is a 4 star graded guest house with self catering option, offering Mossel Bay accommodation for tourists and visitors of on the Garden Route. 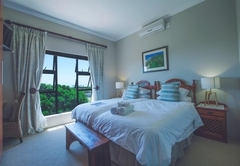 We are your home away from home and will ensure that your holiday or visit to the Garden Route is comfortable, affordable and memorable. 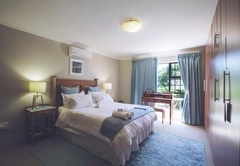 There are five luxury bedrooms, all with en-suite bathrooms. 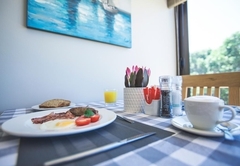 Some have a North facing sea view as well as a view over the golf course, and there is also a luxury self-catering flat 40 metres to the 9th Ladies tee. 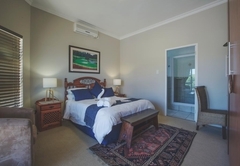 We offer accommodation, on the Mossel Bay Golf Course, Bed & Breakfast, discounted green fees, luxurious en suite bedrooms and a perfect base for playing other Garden Route courses such as Oubaai, Fancourt and Pinnacle Point. 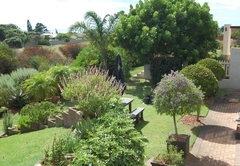 We also offer a private, en suite self-catering unit. 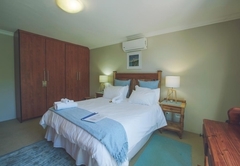 Our luxury rooms are all very similar in size and are furnished with Queen-size & extended-length beds, air-conditioning, satellite TV, bath & shower. 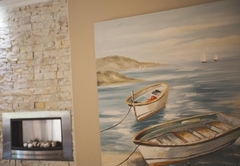 Three bedrooms, all en-suite, surround & share our upstairs lounge, kitchenette and self-service bar. You walk out onto a balcony, with outdoor furniture, where you have a beautiful view, overlooking the golf course and the sea. 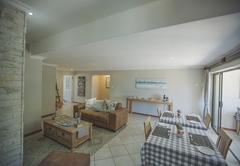 On ground level we have the fully equipped one-bedroom flat with its own lounge, sleeper-couch and kitchenette and the same facilities as above. 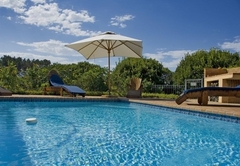 In the private garden there is a swimming pool with deck chairs and umbrella if required. Our back door is 40 metres from the 9th fairway's Ladies tee! 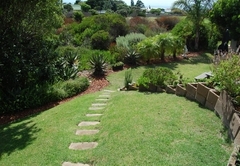 The Mossel Bay Golf Course is a Links course with spectacular views over the southern & northern seas. As their slogan says "you can see the sea from every tee". 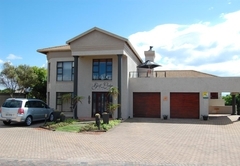 The developer recently spent R2 million in upgrading the clubhouse to a five star facility with a restaurant, bars, squash courts & a tennis court. 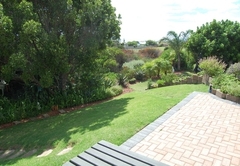 Guests of the Golf Lodge qualify for preferential rates on the Mossel Bay Golf Course. Delicious meals are served at the Fairways Restaurant, which is situated in the Mossel Bay Golf Club and is open to all. 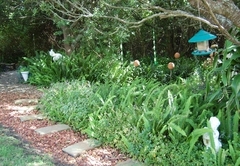 There are walking trails with fynbos, wild flowers, bird life and several Springbuck, Guinea Fowl, Francolins and other wild life experience, for the outdoor adventurer. 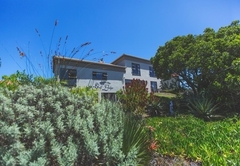 Ground floor, Queen-size bed, en suite, bath & shower A/C TV. This is a smaller room at a smaller price. 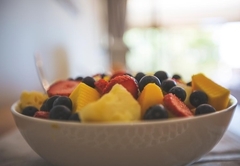 English Breakfast served. 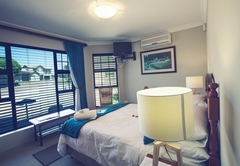 Superior Bedroom with Queen bed and en suite Bath & Shower, A/C & TV. 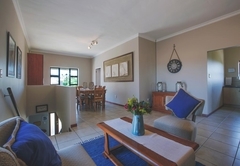 Rooms 1, 2 & 3 also share a common lounge, with satellite TV channelled to all rooms. English Breakfast served! Queen-size bed overlooking garden & pool. Bath & Shower, A/C & TV. 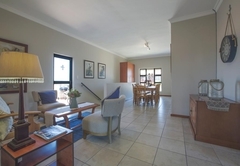 Rooms 1,2 & 3 also share a common lounge, with satellite TV channelled to all rooms. English Breakfast served. 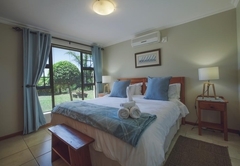 Twin extra length beds, en suite, Bath & Shower overlooking garden, A/C & TV. Rooms 1,2 & 3 share a common lounge, with satellite TV channelled to all rooms. English Breakfast served. 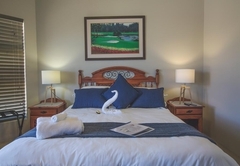 Specious Luxury Suite with Queen size bed, full en-suite bathroom. 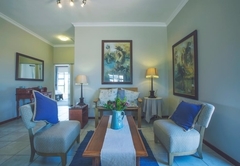 Self-catering Suite, on ground floor. 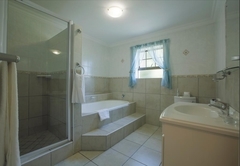 Bedroom, en suite bathroom (shower) with A/C. 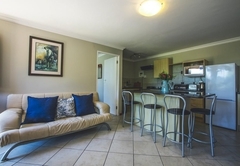 Lounge/kitchen has full size fridge/freezer, cooking utensils & Satellite TV. 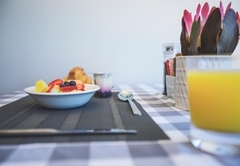 Does not include breakfast but optional English Breakfast is available. Many Thanks for a warm & Friendly welcome and a most enjoyable stay. A pleasant and quiet home away from home. Thanks for the homely experience. 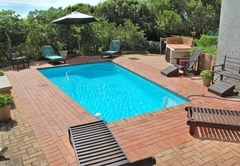 Response timeMossel Bay Golf Lodge typically responds to requests in 5-10 minutes.